All Finn and Jake need to do is convince the Monkey Wizard to kidnap Painting Princess, shouldn’t be too hard...right? Finn is suffering from Quest Deficiency and needs his pals to help him turn up a righteous quest that will fulfill all his adventuring needs! The back of a questing board might seem like the easiest answer, but our hero is about to find out that the easy way our an create a ton of trouble... It's a race against time as Finn and his merry band of questing cohorts fight to complete this switcharoo of a mission before the land of Ooo completely destroys itself! 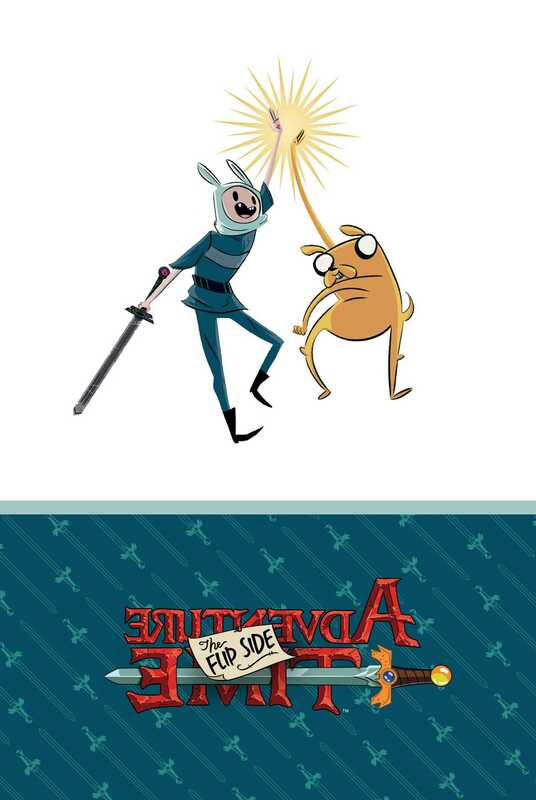 Written by world adventurers Paul Tobin and Colleen Coover and illustrated by Wook-Jin Clark, ADVENTURE TIME: THE FLIP SIDE is a fun-filled adventure that will turn your worldview upside down. Paul Tobin is comic book writer whose best known works include: The Age of the Sentry, Marvel Adventures: Fantastic Four, Marvel Adventures: Super Heroes, Marvel Adventures: Spider-Man, and other titles predominantly for Marvel Comics. Colleen Coover lives in Portland, OR with her husband, fellow writer Paul Tobin. She is a member of Periscope Studio, a collective of more than twenty artists and writers who share a studio space in downtown Portland. Her comics include the adult title Small Favors and the all-ages Banana Sunday, and I frequently contribute comic strips to a variety of Marvel Comics. My illustrations appear in newspapers, magazines, and promotional materials. Wook Jin Clark was born in Seoul, South Korea, and raised in the South Carolina and Georgia. Now residing in Portland, Oregon, he is a member of Periscope Studio. He illustrated “The Return of King Doug” in late 2009 for Oni Press, which was named to the ALA Great Graphic Novels for Teens list in 2010. His new ongoing creator owned series, “MEGAGOGO”, also with Oni Press will commenced in February 2014. He recently completed a spinoff Adventure Time mini-series (Adventure Time: The Flip Side) for BOOM! Studios with fellow studio mates, Colleen Coover and Paul Tobin.